A Mercedes-Benz commercial vehicle dealer in Sussex and Surrey providing all your truck and van needs. With sites in Aldershot, Crawley, Eastbourne and Worthing, we've got you covered. We have an extensive range of New and Used stock in vans and trucks. We are sure to have the Mercedes-Benz commercial vehicle to meet your requirements. Our experienced truck and van sales teams are always on hand to offer advice and assistance to help you choose the right Mercedes-Benz commercial vehicle for your business or personal use. We also have state-of-the art Service and Parts facilities at all of our sites - Aldershot, Crawley, Eastbourne and Worthing - using the latest diagnostic equipment and genuine Mercedes-Benz truck and van parts, ensuring that all vehicles serviced by us receive the treatment you expect from Mercedes-Benz. Rossetts Commercials we are committed to providing customers with ‘one-stop shop’ for your Truck or Van needs. This explains why, we have just opened our second Authorised Testing Facility for Truck MOTs. Crucially, and unlike our established ATF in Aldershot, access to the new Worthing bay is restricted to oporators of Mercedes-Benz and FUSO vehicles – it is to you, our valued customers, that we owe the highest allegiance, so we want to ensure that the new ATF is always available when you need it. We have an extensive range of New and Used stock in Vans and Truck. 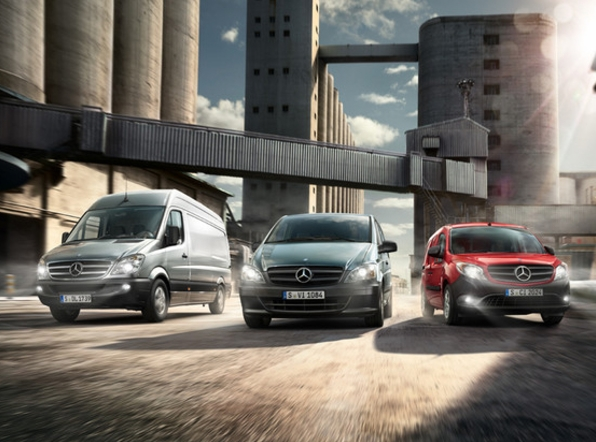 We are sure to have the Mercedes-Benz Commercial Vehicle to meet your every requirement.